Tuesday To-Do #4 and #3 List Makers! Hi sweet friends! Its me! Things haven't gotten pretty crazy around here...lots of things going on! Need to post some projects, but have had a hard time finding ANY time to sit down at the computer...thank goodness for Iphones!! Here are some of my favorites for last week! Be sure to check them out! 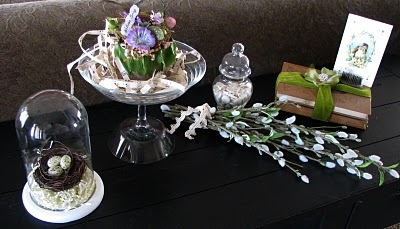 Butterscotch Caramel shared this clever idea for wrapping up a candy bar...sweet! Grunged, Glittered 'n Branded shows how to make these super cute magnet boards...have a feeling my kids teachers' will be seeing this one before the year ends! 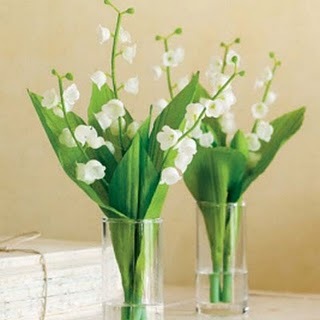 There are so many ideas I'm going to steal from Musings by Kim K. lovely spring vingette! If you were on this week's To Do List, then please feel free to grab a button from the BUTTON page! Another great week of ideas!!! So many to put on my TO-DO LIST!! Here are just a few that I'd like to get to one day! A friend of mine just did a re-do of her son's room in the surf motif...I wonder if she'd like me to make her one of these cute PB knock-offs from Glittered, Grunged & Branded?!? No, I'm not one of the the Three Sisterz, I just wanna be! This bib necklace made from vintage jewelry is such a timely idea for me! I was just going through some of my Mem-Maw's costume jewelry last week...what a great way to give it new life and to wear something special from her?! LOVE it! Where can I put a great cabinet door chalkboard?!? My favorite part about this one is the clever use of the drawer pull for storage...too cute! Dukes and Duchesses made this one for her daughter's room from inspiration from another blog...isn't blogland the best?!? Thanks to everyone for a GREAT first Tuesday To Do Party! Cupcakes, Kisses & Crumbs is doing some Spring Cleaning with a list of objectives to cover...really WANT to do this, but may have to break her plan down into several much...smaller...plans! I'm motivated none the less...you will be, too! 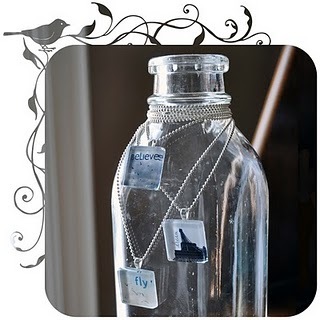 Definitely going to give these gorgeous glass tile charms a try. Lorrie Everitt Studios has a beautiful tutorial to show you how, too! Thanks to everyone for posting their lovely packages and gift ideas last week! 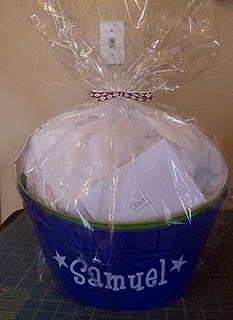 Liz at Fast Daze put together this adorable gift using a personalized bucket for a baby shower...so cute!!! Love this idea for a baby shower!!! Milk and cookies!!! Check out the "how-to" over at Glitter & Gumdrops! J Bee Delightful shows you how to put together this delightful diaper cake! 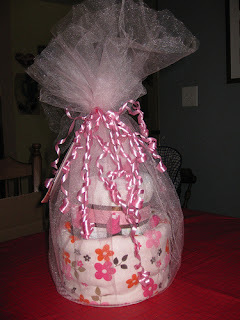 Now this one from the Tattered Tag has nothing to do with a baby shower...I just like all of the burlap and jute! If you were featured, feel free to take a Pretty Packages Feature Button! Thanks again to everyone who linked up! Can't wait to see everyone again next month! Can you bear to see one more appliqued shamrock tee?!? Those Three Sisterz really know how to inspire!! For full on instructions and inspiration, you gotta see what those ladies are up to! They have the pattern...I used Marcelle Script at 275 point for "Lucky." Hope y'all are having a great Spring Break! The little shirt I made for Ella turned out so sweet, I wanted to try one for the boys. The shamrock is camo print and the wording is Marcelle Script at 275. My cool dud in his "lucky" shirt! 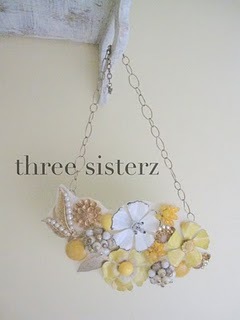 Thanks again to Three Sisterz for their inspiration!! Stop by the Tuesday To Do Party!! 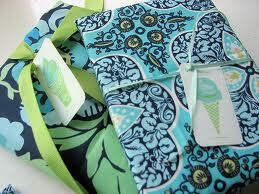 On a previous Tuesday To Do post, I featured some super sweet shamrock appliqued shirts by Three Sisterz. Here's my version for my sweet little friend Ella. Now I'm just going to wrap it super cute and wait for my little friend to arrive...I CAN"T WAIT!!!! Looking for the PRETTY PACKAGES PARTY?!? Tuesday To Do - ITS A PARTY!!! Well, I've been considering doing a weekly party now for a while. When I check out other parties, I've been selecting ideas I want to try and adding them to my Tuesday To-Do post...simply a way for me to keep up with (and easily find) ideas I want to try. So my laziness has taken over and I want all of those amazing ideas to come to me...if I build it, will they come? OH, I hope so. 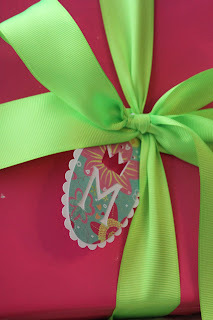 Click here to LINK UP to the PRETTY PACKAGES PARTY! Find the TUESDAY TO DO PARTY here! 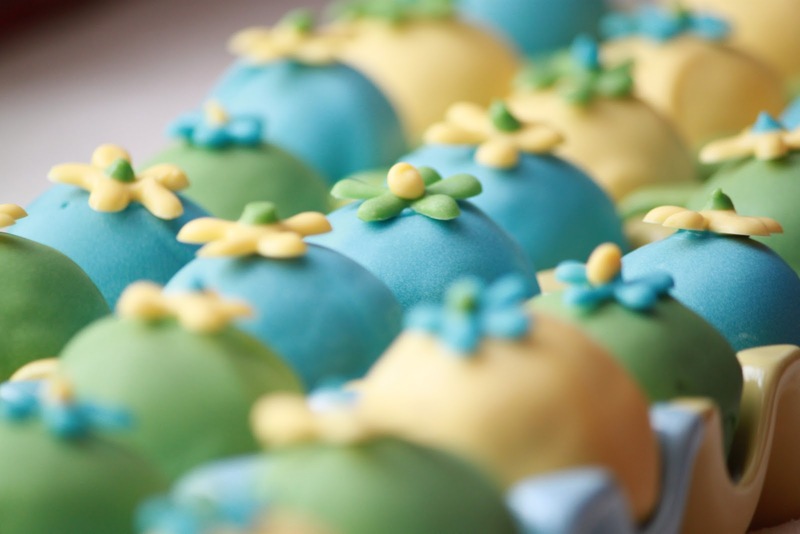 Sweet little red velvet cake balls created for a baby shower. 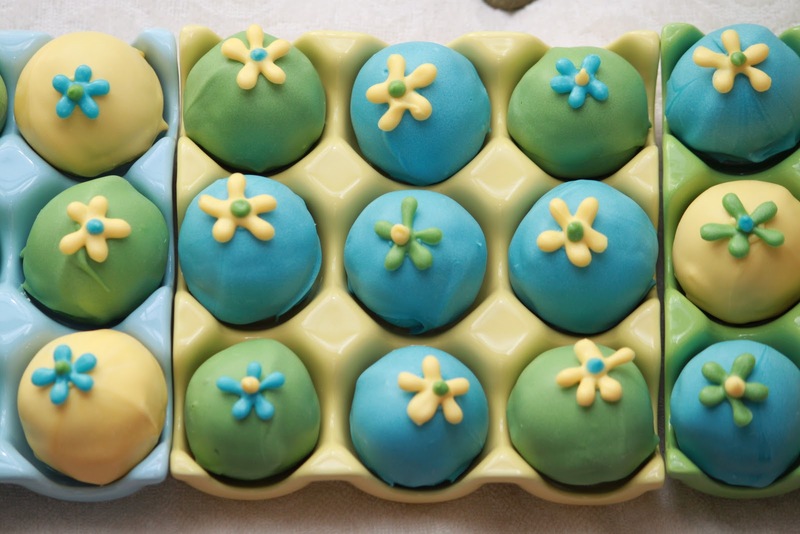 Aqua, green & yellow cake balls all in a row! 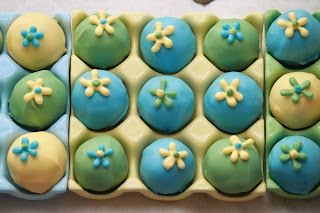 My handy dandy ceramic egg crates matched perfectly! Welcome to the Pretty Packages Party #7! I love seeing all of your lovely packages and gift ideas each month! Since St. Paddy's day is just around the corner, I've got green on my mind! I just love how it makes a gift pop! Carolyn Rhoeme. (It doesn't appear as if she is maintaining her website anymore, but it still has some lovely ideas!) 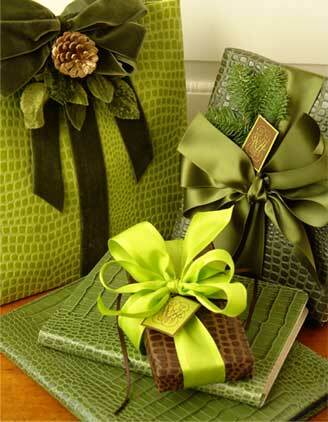 Be sure to check out her book, PRESENTATIONS, for some of the most beautifully wrapped gifts you'll ever seen! She has a purple and green package that is to die for! Isn't the black & white paper with the green ribbon so fresh looking?!? This is from French Garden House. 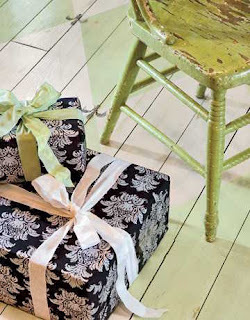 Country Living shared these sweet packages. This was just a stock photo I found. The modern pattern with the rustic raffia look great together! 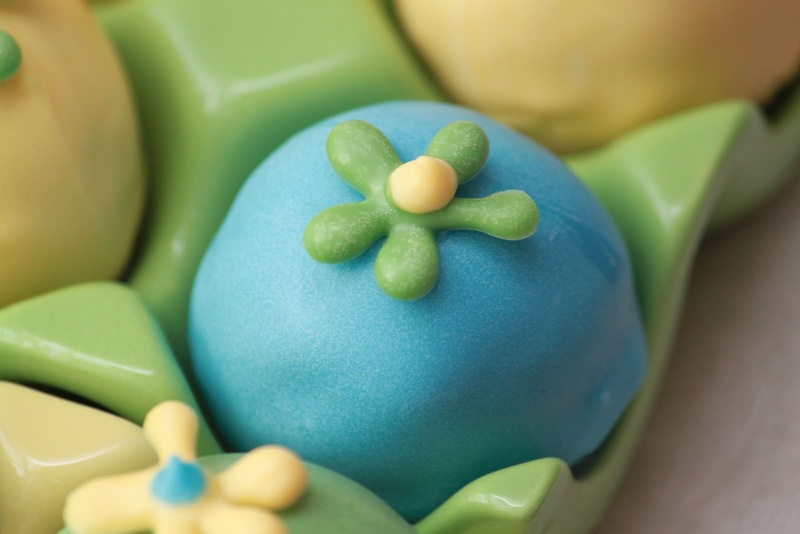 Aqua and lime green are a gorgeous combination! Polka Dot Cottage presents these beauties! Pink and green are a never fail happy look. This was a quick package I put together for a sweet friend of Jack's. Now, lets see what Pretty Packages you've put together! 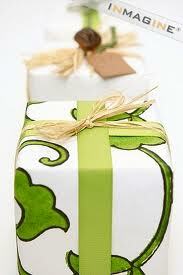 This is a PRETTY PACKAGES PARTY so what I'm looking for is beautifully, interestingly, creatively wrapped gifts. 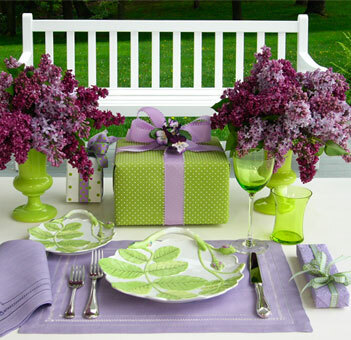 The gifts could range from individual gifts, to party favors, to food gifts to birthday presents, to any type of gift or packaging! At the end of the week (if I can wait that long,) I'll chose my favorites to share with everyone. Please be sure to add your permalink below, and not your general blog address. To get your permalink, click on your post name, then just copy and paste the address that shows up in the address bar at the top, into the "url" box for the picture linky. You'll also need to put your e-mail address in, but don't worry, it will not be visible to anyone. It would be fantastic if you would include the Pretty Packages Party button in your post, to make it easy for others to find your Pretty Package post. To do that, just copy and paste the Pretty Packages Party button to your computer or grab the html code from underneath the Pretty Packages Party button on my sidebar. A text link under your post is great, too! Please include a link in your Pretty Packages Party post back to the host blog, The Blackberry Vine. Why is this important? When you include a link back to The Blackberry Vine, it ensures your regular readers/visitors will find the other gorgeously wrapped gifts linked to the Pretty Packages Party. If everyone links back, this maximizes the opportunity for visits for all who participate. Please do not add your link below, until your Pretty Packages Party post is actually published to your blog. Another helpful hint...DO NOT type in all caps...it makes it very difficult to read! Thanks! Last, but certainly not least, please comment on the post in front of you and behind you (and any other post!! )...spread the comment love! Be Sure To Link Up To The PRETTY PACKAGES PARTY! My grandmother blessed our family with a gift more precious than any material possession. She created a book with our family history. She researched and investigated my grandfather's family tracing it back to its origins in Ireland. Our family has a rich history of many different personalities and backgrounds. Royalty and peasants, cowboys and indians, Rebels and Yanks, Amercian Revolutionary soldiers (I'm a DAR member because of her passion for family history) and Texas Revolutionary soldiers and everything in between make up our amazing family. Because of her hard work, my grandfather, whom I never had the privlege of knowing, comes alive with stories and pictures. When I saw Martha Stewart's version of this family tree, I wanted to make one for my parents, (they just celebrated their 52nd Wedding Anniversary in January,) as well as for my parents-in-love...I'll take them to a printer to have them copied for my brothers and sister-in-love. Rather than printing in off as in Martha's version, I painted my own with watercolor using her's as a guide. I followed her instructions for hand-edging the name cards with gold paint. I was very happy with the results and look forward to presenting it to my parents this weekend. I'll present YOU with the tutorial in a few days. If you can't wait that long to give it a try, then scoot on over to Martha's and check it out for yourself! The Tuesday To Do Party is HERE! OH! Don't forget stop by tomorrow thru the 12th for the Pretty Packages Party! Don't Forget to Link Up to THE PRETTY PACKAGES PARTY! This cake was created for a sweet little girl's Ladybug Birthday Party. It was a classic white cake with classic French buttercream frosting and filling. This little ladybug is a little love bug! Little ladybugs crawling around the 2nd tier....just where are they going?!?! Ruffles and lace give a lovely foundation for this sweet cake.